Transformer oil filling - ! Equipment for Transformer Oil Reclamation. GlobeCore. The term “transformer oil filling”, as it is used in this article, has two meanings. The first is the process that compensates for the loss of oil in the course of transformer operation. The second is filling a transformer with oil before commissioning or after an overhaul. Oil is an essential part of the transformer. In insulates energized components, dissipates heat and protects solid insulation from moisture. If oil level drops for some reason, the windings and the core of the transformer can overheat, beside the loss of dielectric strength of the insulation system in general. This leads to faults and failures of transformers, causing multimillion dollar losses. This is why transformer oil filling must only be performed by qualified personnel with all possible care. leaks in the oil system. Oil filling is also required for switches and and measuring transformers. Switches may require oil filling both after sampling and leaks, and to compensate for the loss of insulation liquid volume due to arcing. In the course of transformer operation, the level of oil must be checked. This process is made simple by oil indicators, installed in the walls of transformer tanks or expansion tanks. If the level of oil drops below the minimum, the transformer must be taken offline and checked for leaks. If the unit is air tight, oil filling can be performed. Can oil types be mixed? In many cases, transformer oil filling is needed, but the required type of insulation liquid is not readily available. The question is, can transformer oils be mixed? Transformer manufacturer usually provide guiding information. Some prohibit mixing of oils made from different sorts of crude. Others allow mixing of various oils, but only if both types either contain or do not contain antioxidant additives. When mixing oils with and without the additives, a preliminary analysis is needed to determine the general stability of the mixture for the given ratio. The GlobeCore CMM-4/7 can be used for oil filling before commissioning or after an overhaul. This unit performs several functions, making it a good choice for use with transformers. The СММ-4/7 is used to prepare transformer oil (degas, remove water and solids), evacuation of transformer tanks and filling them with oil. Note that oil filling in transformers up to 110 kV does not require vacuum. However, without airtight protection of the oil and voltages of 150-500 kV, vacuum is necessary. Transformer oil filling has a few distinctions when performed in the course of transformer operation. No vacuum is required with voltages up to 35 kV. The oil must be cooler than transformer core, but hotter than 10 ºС. Evacuation is required with voltages above 110 kV. 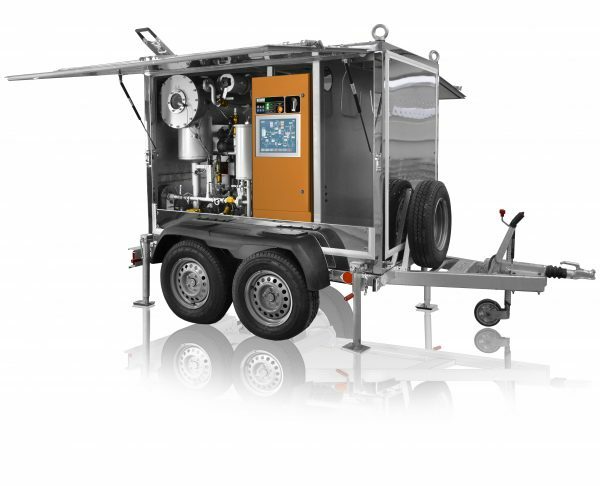 The UDM unit has been designed specifically to pump, store, transport and add oil. The unit is equipped with a 1000 liter oil container, and the maximum capacity of the filling pump is 1.7 m3/hour. 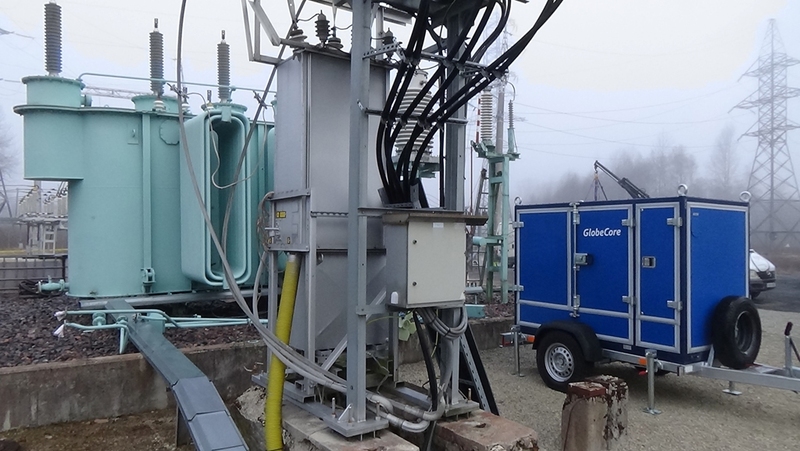 GlobeCore also offers products which add oil through transformer and switch bushings. These are the UVD types units, which can prepare (degass), store and transport small batches of oil (up to 30 liters). The volume of the actual filling section is 4 liters. 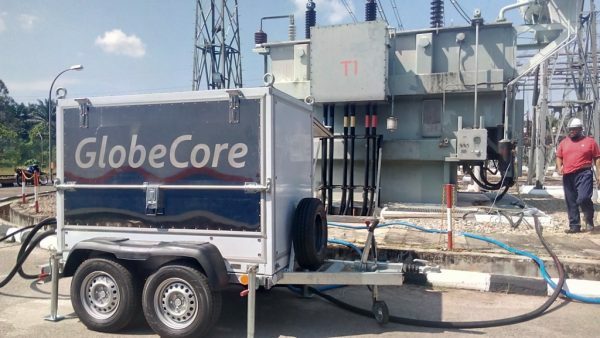 GlobeCore products cover the whole spectrum of transformer oil filling and adding oil to electrical systems.